Are you sitting comfortably? Do you have a drink: a cuppa, a beer or a gin (whatever your preference is, depending on when you’re reading this) to hand? Well rested and alert? Good, because we have lots to get through this week. 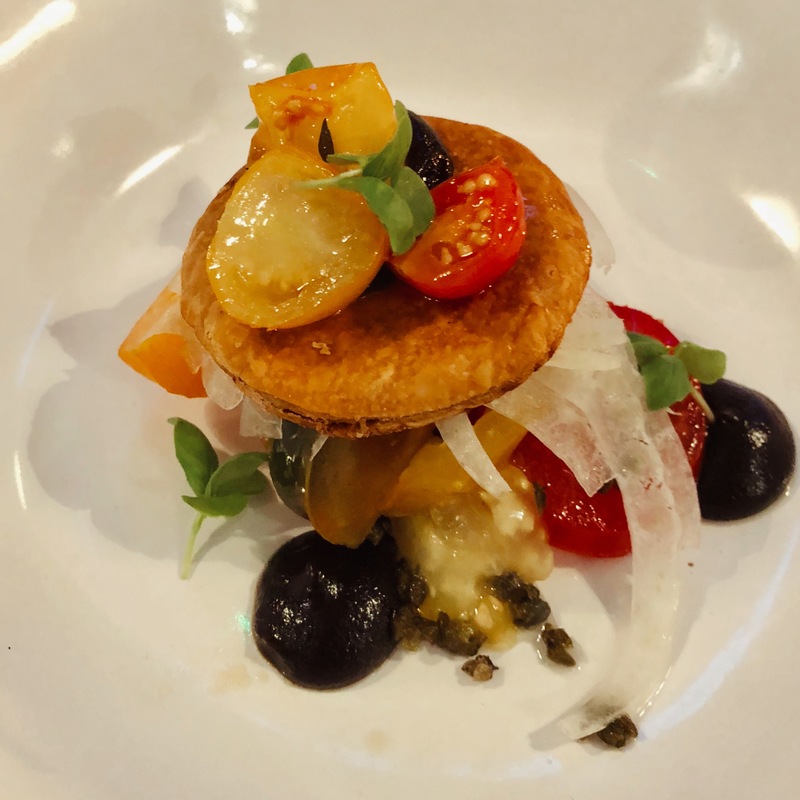 Eighteen dishes, four courses, plenty of photos – so much in fact that I’m not sure whether I’m writing a review or organising a school trip (quiet at the back, you two). I’ll try to rein in my tendency to be prolix, and you’ll have to focus. Right, let’s do this. It’s my fault we’re in this position. 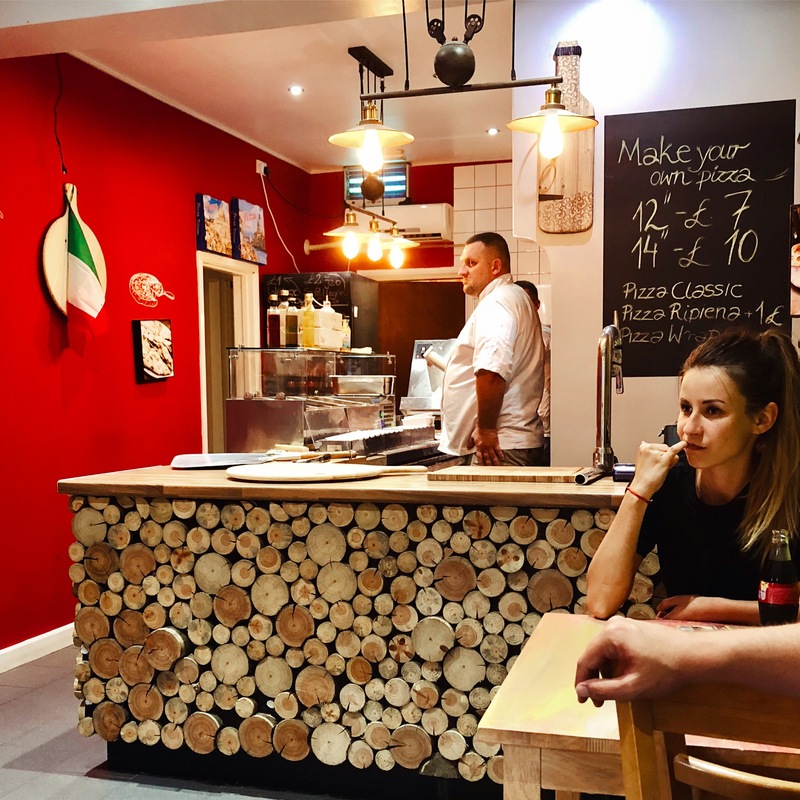 I went out to celebrate the fifth birthday of the blog – no, we don’t have time for me to wang on about that either – and I chose somewhere which looked special on paper. The Bottle & Glass Inn, in the pretty village of Binfield Heath, out towards Henley, had been on my wish list for a while. 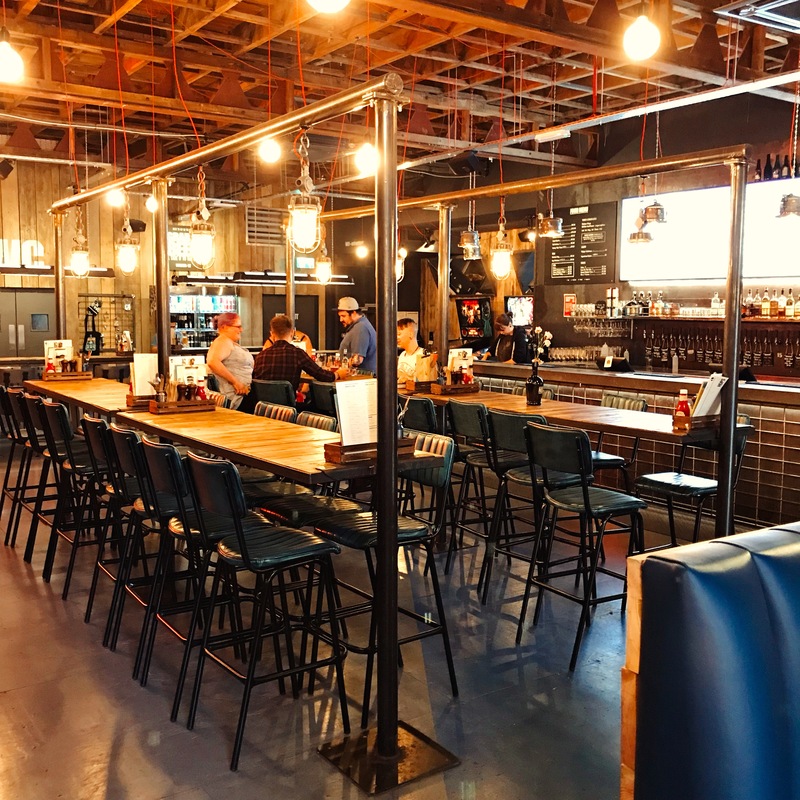 It reopened last year with great credentials, taken over by the former managers of London’s Michelin-starred pub the Harwood Arms. By October it had received a Michelin Plate, usually a sign that the tire-sellers consider a place marked for Great Things. How often do I review somewhere that’s been mentioned in Country Life, very much Edible Reading’s spiritual twin? The other reason we have much to discuss is that on this occasion I went out on duty in a four. So it was my mother, my stepfather, my close friend Zoë and I (a team of all the talents if ever there was one) who pulled up outside the Bottle & Glass on a Friday night, ready to celebrate and – hopefully – to be wowed. It’s a gorgeous pub. It’s thatched and beamed (it’s a listed building, unsurprisingly) and the bar looks like the comfiest, cosiest place to nurse a drink. Like many such places, they’ve built a tasteful extension where they actually feed people. I’ve sat in such extensions many times (The Wellington Arms, The Hind’s Head, The Crooked Billet and so on) and however nice they are you always feel a little like you’re missing out. Even so, the dining room in the Bottle & Glass was rather fetching: big capable tables, tastefully painted walls, a rather fetching green tweed banquette. Not perfect, though – the lack of softness and the bifold doors along one side made the room more deafening than buzzy, and the fact that there was another room beyond made this one feel a little like a fine dining corridor. I liked the look of the menu, but it wasn’t without its complications to navigate. I know my mother well, and she didn’t take to it from the off; she doesn’t like pickles and, in one shape or another, they featured in every starter but one. The other complication was working out who would order what. My stepfather gallantly, insisted that we should all order separate courses (“for the blog”, he said). But that, combined with multiple requests of “can I order last?” turned the whole thing into one of those logic puzzles where X won’t sit on the right of Y, can’t sit opposite his ex-wife Z and is wearing red so can’t sit on the left of A (pretty soon logic puzzles will just involve trying to plan a dinner party for 12 people with a total of 6 different food allergies/intolerances/preferences, or whatever you call them nowadays). Anyway, we eventually got there. And goodness knows we had plenty of time, because apart from bringing our wine – a very nice, robust Cahors which was just the wrong side of thirty pounds a bottle – we waited a long time, almost half an hour, before anybody came to take our order. It was especially frustrating as the menu had things in the “snacks” section that we fancied, and it would have been lovely to at least have those, and some bread, while solving our logic puzzle. More disillusionment came when someone finally arrived at our table. They’d just sold their last of the grouse, he told us (maybe if they’d taken our order a bit sooner…). Worse still, they had run out of double cooked chips. Would we like some boiled new potatoes instead? “That’s not really a very attractive offer, is it?” said my mum. The young waiter smiled blankly at her. The bread was the first to turn up: soda bread, still warm, two little loaves between four. 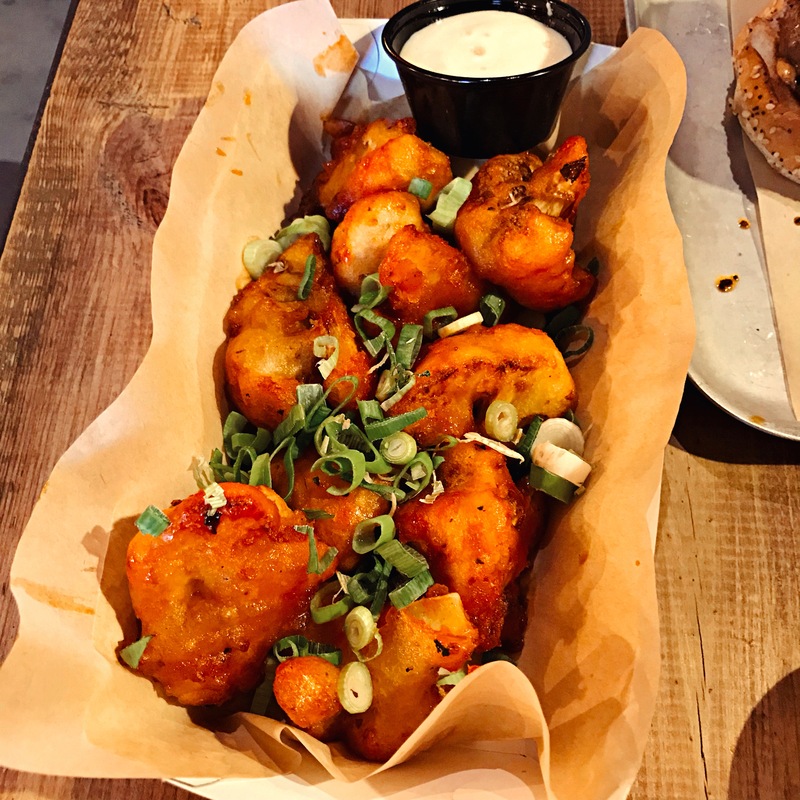 It looked decent, but breaking it open none of us was hugely impressed – the taste was disconcertingly reminiscent of pretzels and, like pretzels, these were on the dry and chewy side, lacking in seasoning. “The butter’s too warm” said my mother, and she was right, although we’d been given so little it seemed a moot point. 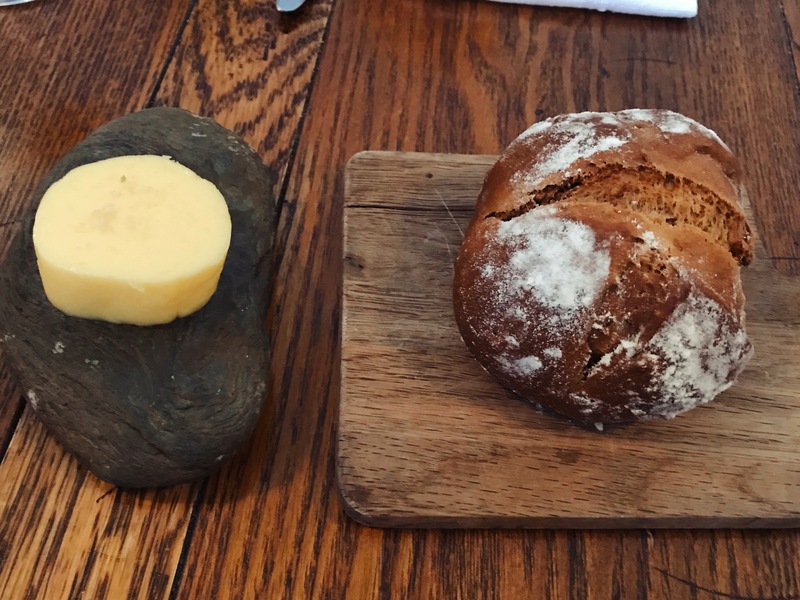 “The bread at the Black Rat is much better” she added, referencing Winchester’s Michelin-starred pub – a reasonable point of comparison – and that reminded me of their amazing squid ink and parmesan rolls. This wasn’t a patch on that, and none of us raced through it. Our snacks arrived not long after. The scotch egg was a beast of a thing, and easily divisible between four. It looked the part, and the texture was note-perfect but seemingly at the expense of the taste: like the bread it was under-seasoned. 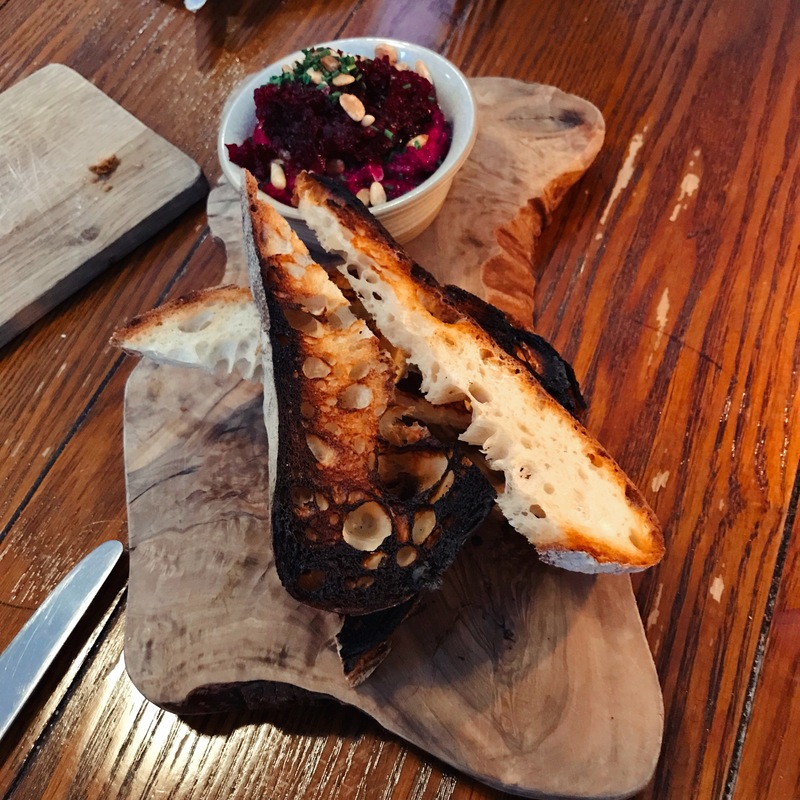 The other snack was beetroot houmous, which was topped with more beetroot and served with sourdough which was verging on cremated. I liked the houmous, and it came with a healthy whack of garlic, but personally I’d have liked more of it and could have done without the extra beetroot. It worried me that the kitchen seemed worse at cooking toast than me (“the taste of carbon might have complimented the garlic” said my stepfather later, “but that feels more like happenstance than grand design”). 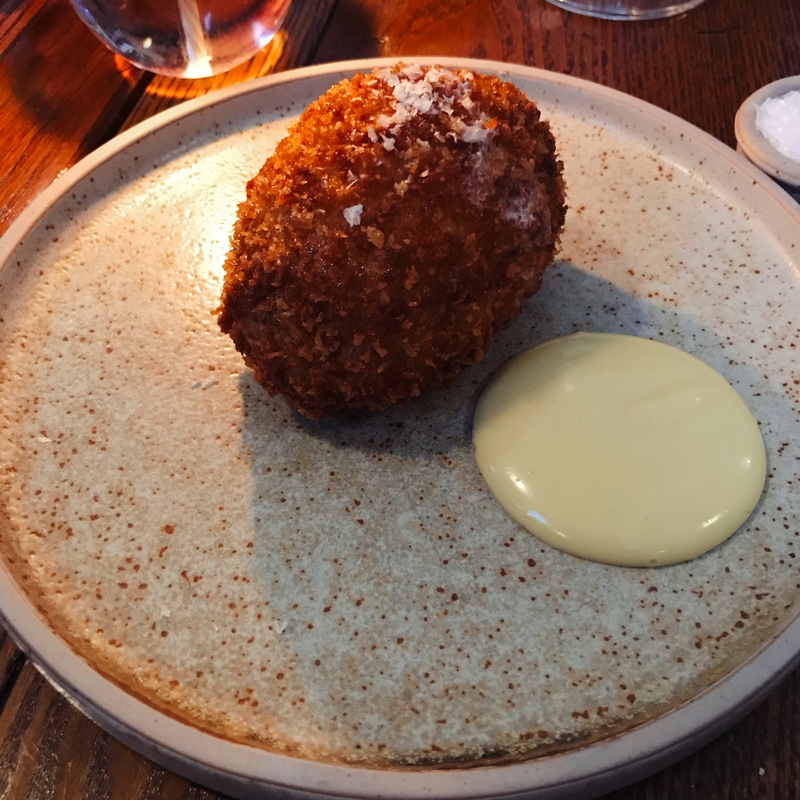 What with the burnt toast, the bland Scotch egg, the AWOL chips and the lack of grouse we all felt faintly mutinous by the time our starters arrived, so it was a relief to find that they were an improvement. 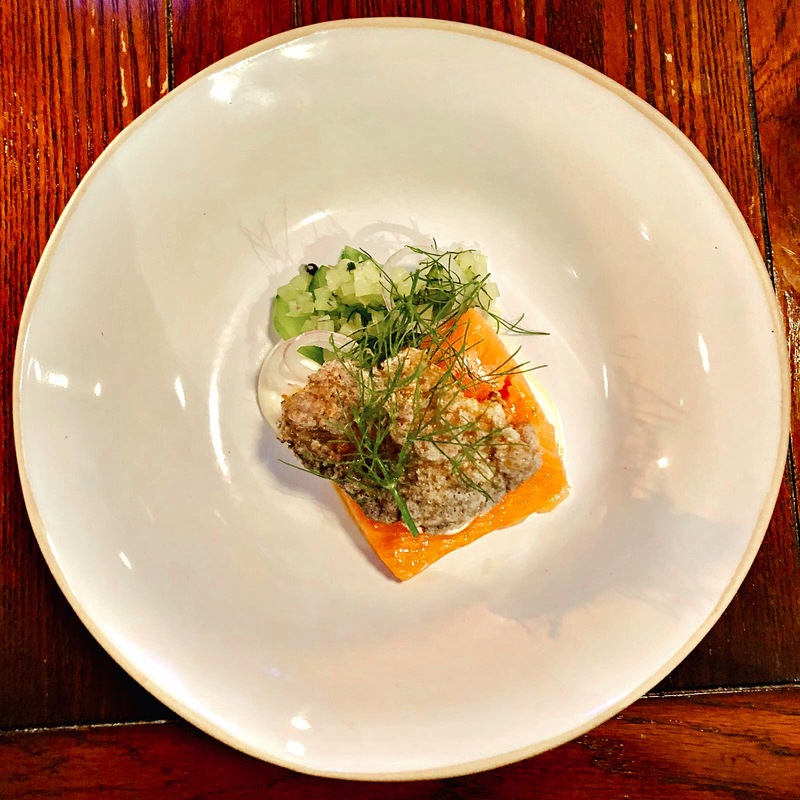 Zoë’s was the pick of the bunch – a big, delicate-tasting piece of salmon, poached so that it broke into large, handsome flakes. The bubbled, crisped salmon skin on top was delicious and light, and the pickled cucumber was sweet rather than sharp. It was also unquestionably the most generous of the starters: I had a mouthful and was more than slightly envious. 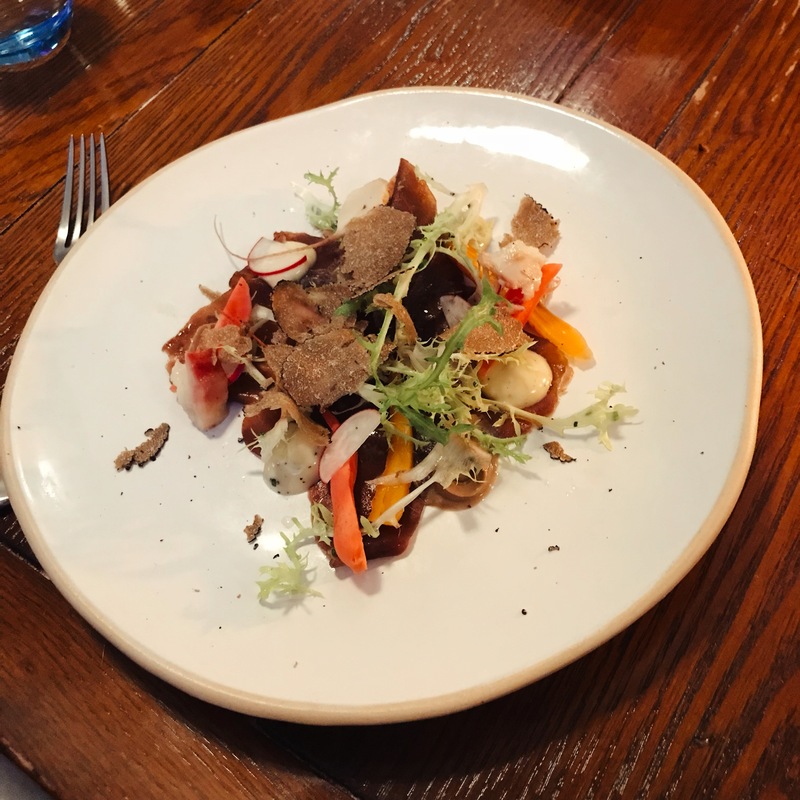 My stepfather’s starter was my second choice on paper – bresaola with smoked bone marrow and summer truffle sounds like all the good things. 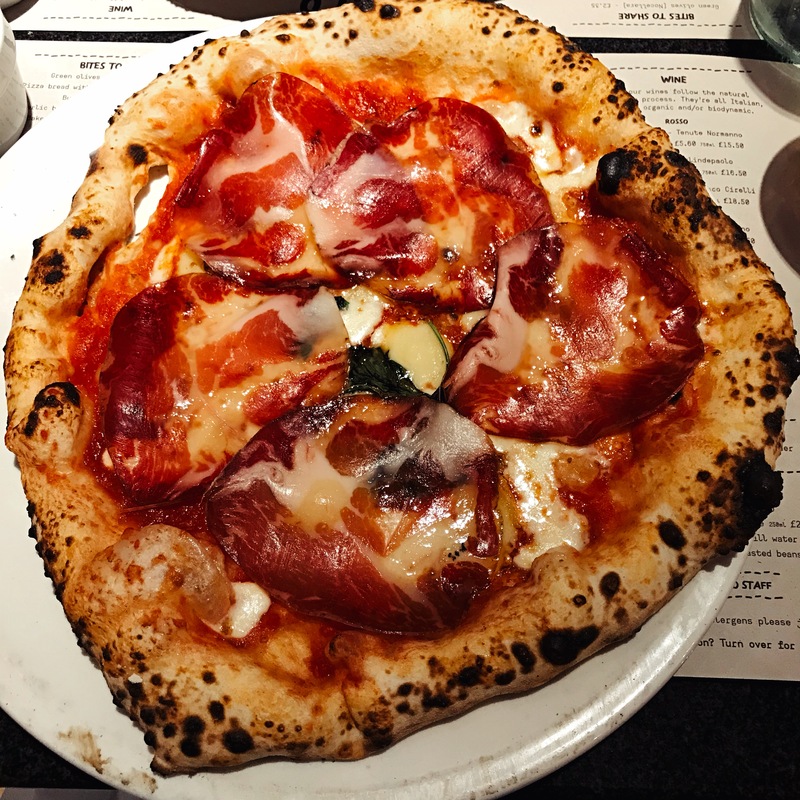 My forkful suggested that the bresaola, hidden underneath everything else, was the star of the show but the whole thing was too bland when on paper it should have been so much more (it reminded me, in fact, of the unedifying two months I spent on Tinder last year). I had chosen the terrine, a slim slice of ham hock and foie gras which, neatly, was both clean and indulgent. 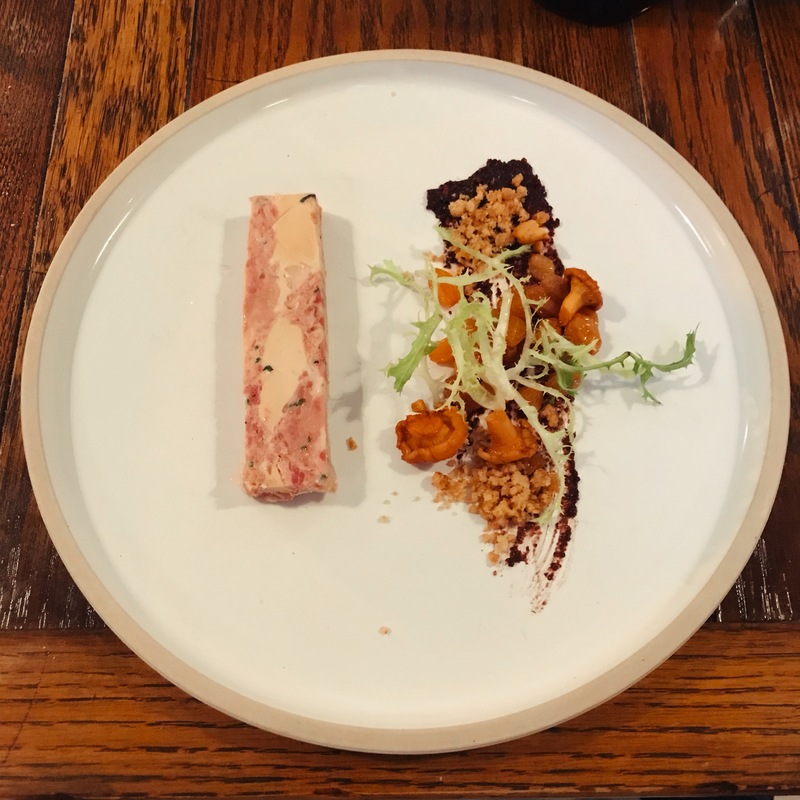 Everything else on the plate went so well with it – golden, plump, sweet sultanas, pickled girolles and some kind of crumb or dust which tasted of the very best pork scratchings with the texture of the beautiful, salty powder left at the bottom of a packet. There was also some “violet mustard” which tasted, as far as I could tell, of mustard. So many tastes and textures here – sweet, sharp, salty and, of course, foie bloody gras – and so much to mix and match that, for once, I didn’t even feel like I would have liked some bread with it. Well, mostly. 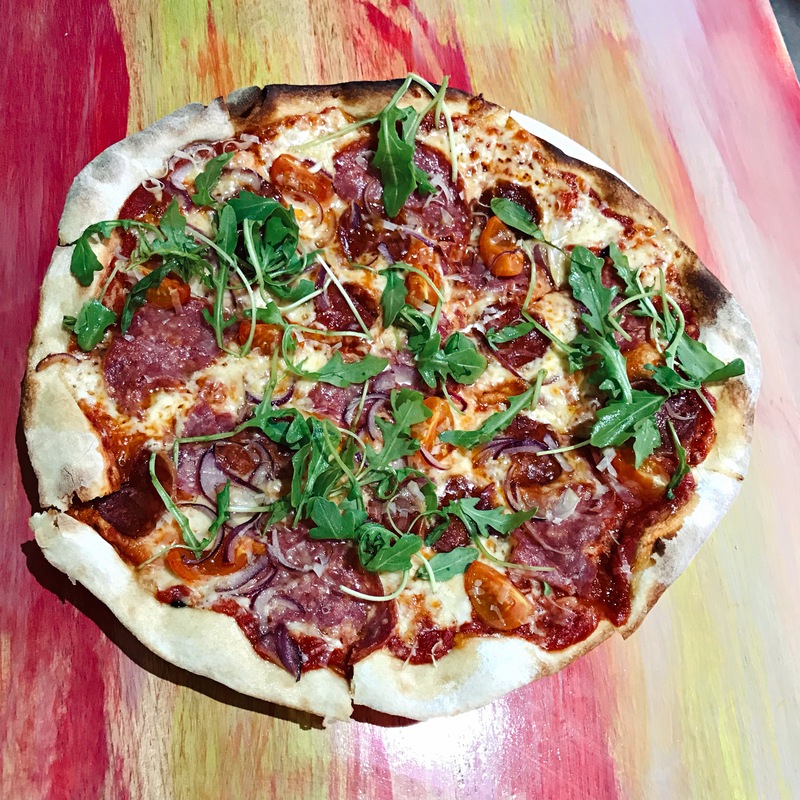 Like the bresaola, it had a little bit of frisée on top, as if to say See? It can’t all be delicious, you know. My mother chose the only pickle-free starter, which contained plenty of unadvertised capers: I’ll let you imagine how happy she felt about that. Billed as a salad of tomatoes with curd, black olive caramel and tomato tea it was a pretty, artfully stacked bunch of tomatoes along with an odd pastry disc which had been added for seemingly no reason. If you like tomatoes this might well have been the dish for you, but my mother was left baffled by it and so, to be honest, was I. It’s the kind of dish I wouldn’t have ordered in a million years, and tasting some didn’t change my mind (interestingly the Bottle & Glass’ Twitter feed has since shown pictures of this dish reworked, so maybe they too weren’t convinced by it). By this point, I increasingly thought it unlikely that all four of us would leave completely satisfied. My mother might have taken against the place, but I agreed that her main course was a little disappointing. Denied the grouse, she instead had the chicken. 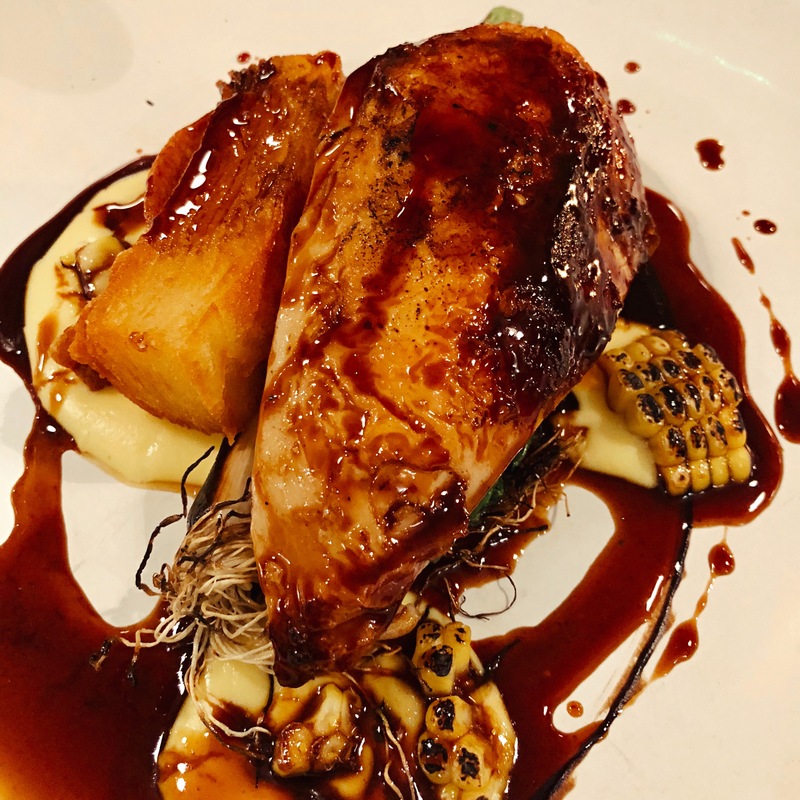 Now, I often think chicken can be a surprisingly good choice in a high end restaurant (especially if they can get the skin right), but the Bottle & Glass served up a gigantic chicken breast, no crispy skin, the usual sticky jus and some charred sweetcorn. There was also black garlic, which I really liked but which my mother found too sweet (sweetness in savoury food, and why it’s beyond the pale, is one of the culinary hills my mother is prepared to die on). Honourable mention has to go to the Maris Piper terrine, a gorgeous stack of wonderfully cooked potato, like a miniature pommes boulangère. Why couldn’t they have rustled some of that up for us, if they’d run out of chips? My mother left a fair bit of the chicken: my stepfather polished it off. My dish was not just venison, but smoked venison – two pieces, seared on the outside but decidedly pink inside (“I think that looks a bit underdone” said my mother, but venison like Turkish delight has always worked for me). I’ve never had it smoked before and it was a revelation: on that basis the Bottle & Glass’ menu could do with a lot more smoking and a little less pickling. 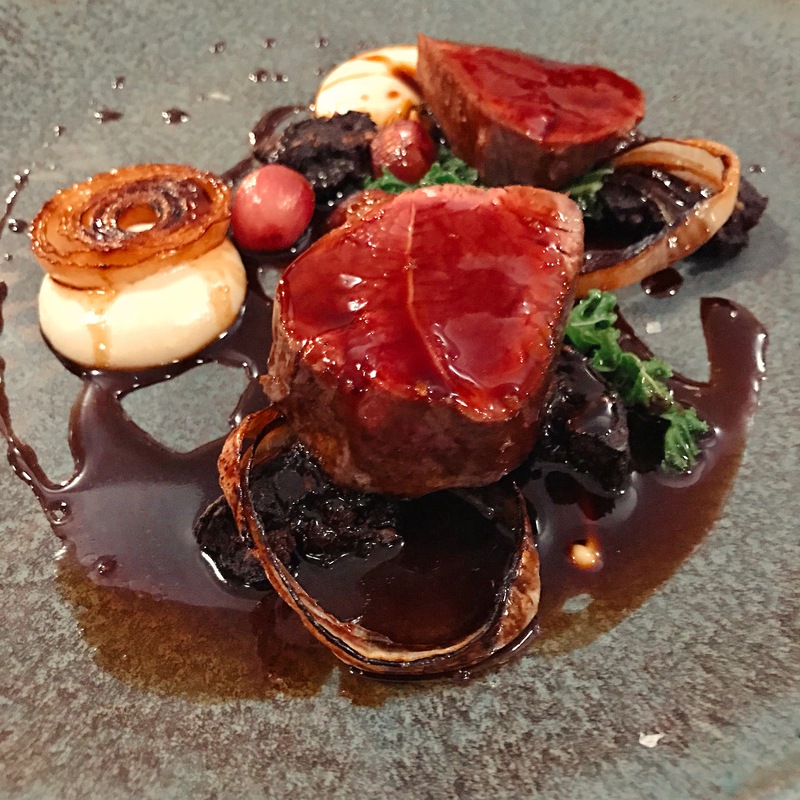 It came with the regulation Michelin-chasing sticky reduction, a purée which might have been celeriac, plenty of roasted shallots and rings of onion, sweet and caramelised and – this may have been why I ordered the dish – almost-crunchy nuggets of black pudding. This was more like it, although it did feel like a dish for the depths of winter plonked in the middle of the summer. 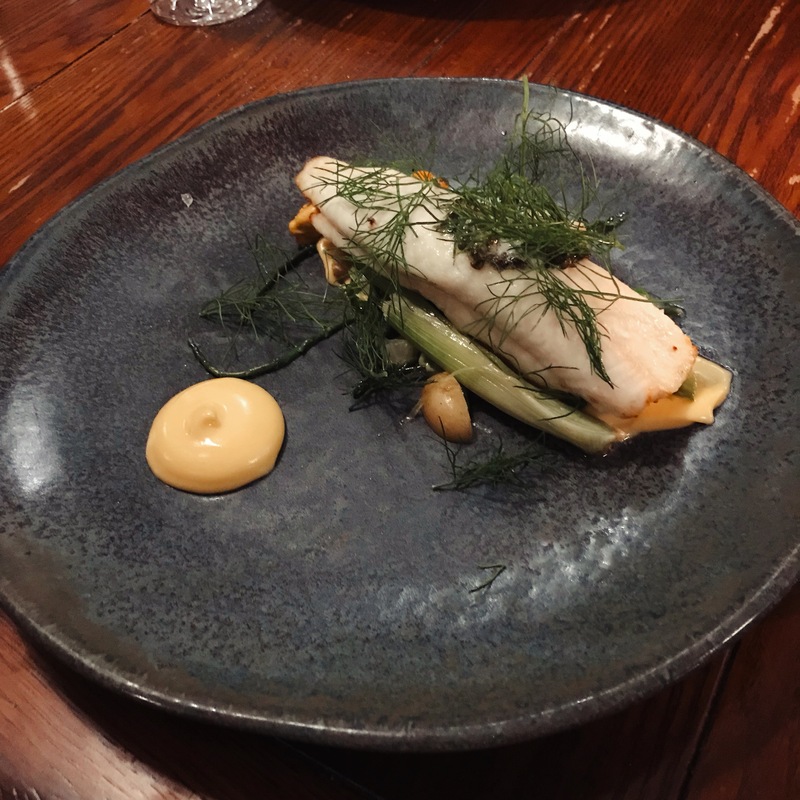 My stepfather is wont to order fish on a menu, when it looks interesting, and he chose the plaice with samphire, mussels and fennel. As you can see from the picture it was a delicate thing and, although he liked it, it was a too delicate for me. I tried some, and you couldn’t deny that the plaice was brilliantly cooked and the fennel lovely and sweet, but I did find myself thinking: where are the carbs? And where’s the rest? There was a little blob of white – possibly the advertised sorrel butter, possibly not – but I would have liked a good beurre blanc with this, or even a beurre noisette. “It was a good low carb option”, my stepfather emailed me later when I asked him for his thoughts, “as THERE WERE NO CHIPS”. Quite. Zoë’s main was the best of the lot. Lamb rump and shoulder (thank heavens they didn’t wankily call it “lamb two ways”) was a very generous helping of pink rump and the highlight, a gorgeous piece of slow-cooked shoulder which simply fell apart. I was allowed to try that, and it was so terrific that I regretted my own menu choice. It made my helping of venison feel a tad stingy, put it that way. It came with artichoke and hasselback potatoes (teeny tiny ones which, again, were never going to redeem the Great Chip Shortage Of 2018), and some manner of green puree – pea, perhaps? – which had been plated up in a manner best described as unnecessarily spaffy. We ordered some side dishes: neither of them added much but bulk. The new potatoes were nicely cooked and firm and tossed in butter and mint – or, according to the menu, “mint butter” – but the whole thing was oddly sweet. The Binfield Heath courgettes (“are they from an allotment then?” said my mother, slightly scornfully) might have ticked all the provenance boxes but really, the advertised thyme butter was missing in action and however multi-coloured they were, they remained big chunks of watery blandness. 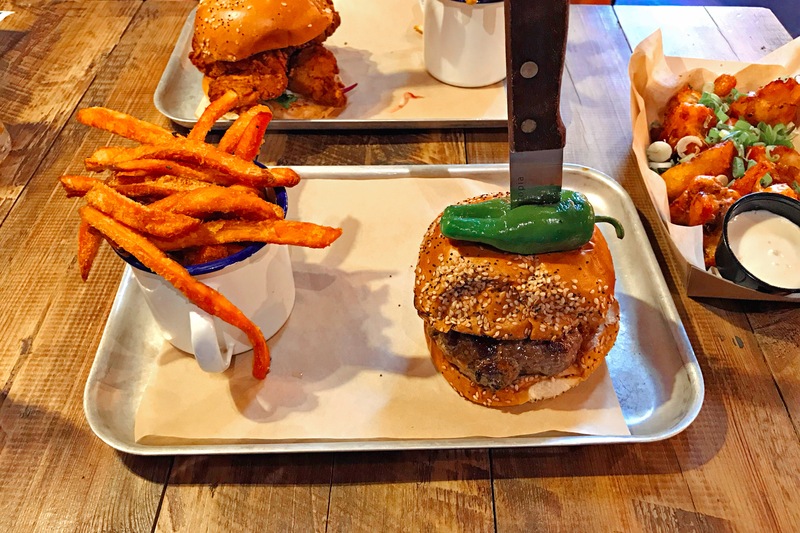 The sides were four pounds fifty each, and the main thing they achieved was to make me really want some chips. 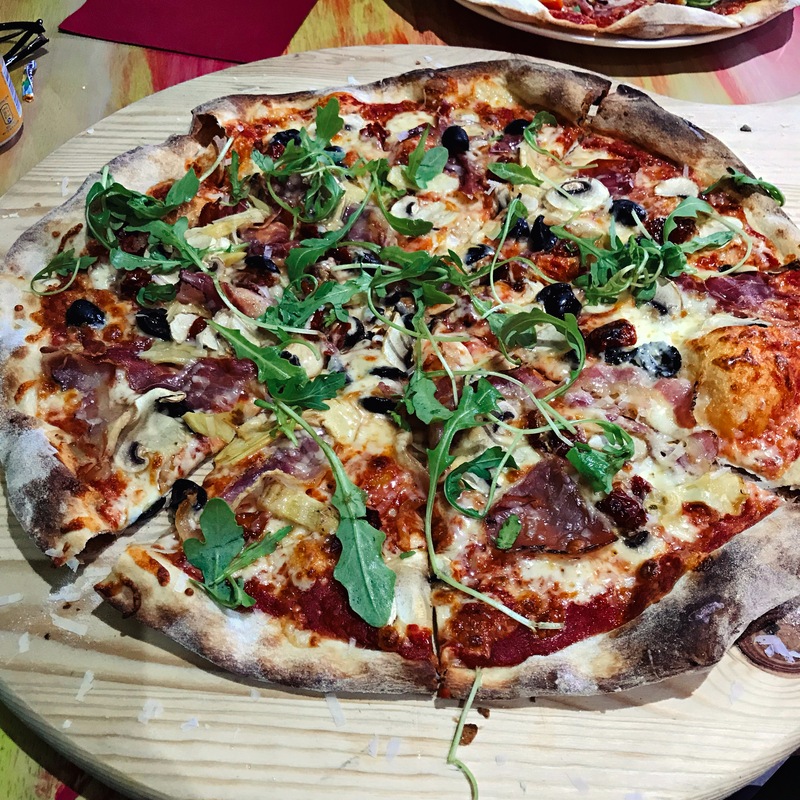 By this point we’d run out of Cahors and three of us drank small glasses of Barbera d’Asti – it was pleasant enough, if lacking in the body and complexity of the red wine we’d just finished. That said, it reflects well that the Bottle & Glass offers quite a few wines by the glass and that, generally, you aren’t penalised for having smaller glasses. In preparation for the desserts to follow, we also ordered a couple of dessert wines. The Pedro Ximenez was, as it usually is, a treacly, sugary delight. My Banyuls was less impressive, again feeling slightly thin and lacking in the complex almost-sweetness you get with the best examples. By this stage I really wasn’t sure what I made of the Bottle & Glass: a feeling the desserts, as it turned out, would only compound. Continuing the trend of the evening, Zoë had chosen the standout, my mother picked the wooden spoon and my stepfather and I were somewhere in the middle. 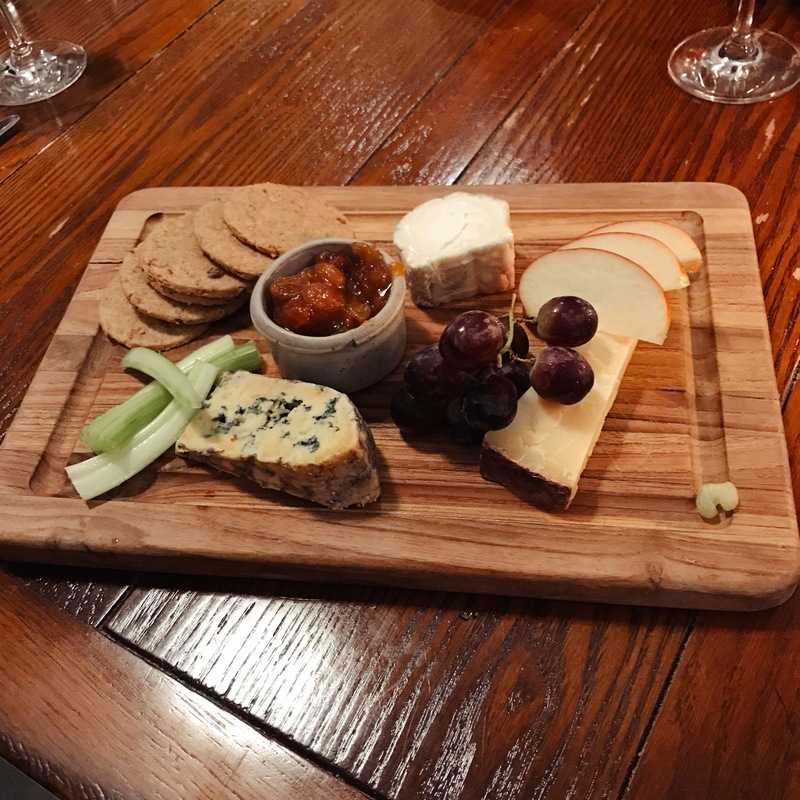 My stepfather’s cheeseboard was a pretty decent offering, I thought – Barkham Blue (it sounds ungrateful to say this, but it feels like Barkham Blue is increasingly ubiquitous on cheeseboards: the victim of its own success, perhaps), a crumbly Lincolnshire Poacher – to my money the equal of any mature cheddar you can lay your hands on – and Bosworth Ash, a very creditable goat’s cheese. I do admire a place confident enough to give you good helpings of a few cheeses – a lot of a little rather, than a little of a lot. Nice crackers and chutney, too. I had gone, as I so often do, for the chocolate dessert and it wasn’t bad, although not what I was expecting from the description. “Chocolate cream” did form part of it, and it was pleasant enough, and then there was a big slab of something partway between a brownie and a ganache which rather dominated the whole thing. The best bit of it was the mint ice cream, perched on top – the sweetness that hadn’t worked with the potatoes went brilliantly here. Good enough, but not particularly exciting. 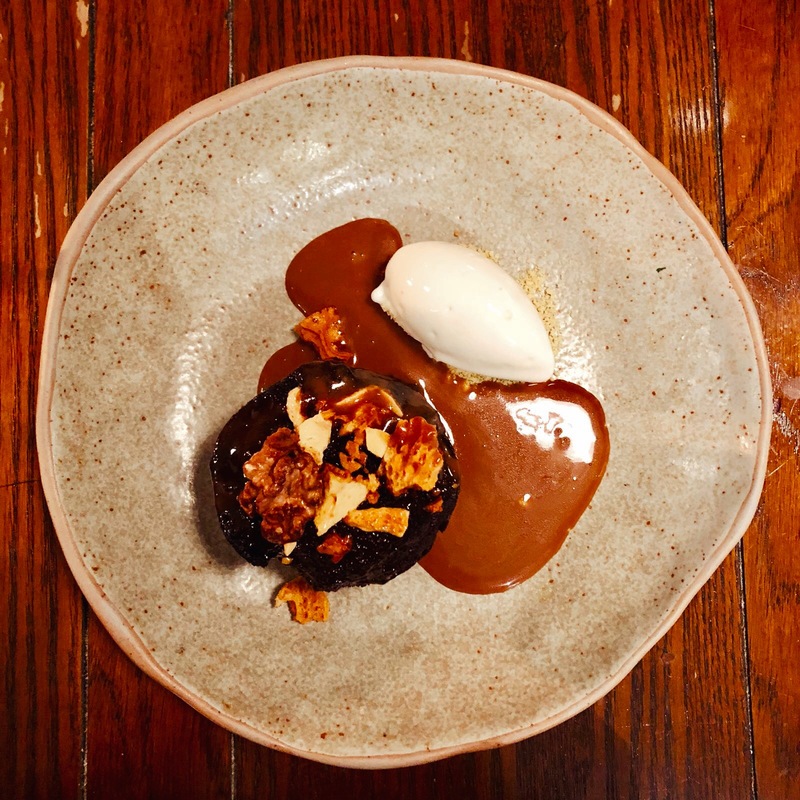 Zoë was delighted by her dessert, because you can call it a date and walnut sponge all you like but when it turns up hot with butterscotch sauce and ice cream it’s basically sticky toffee pudding. Having to listen to the raptures, this time, was slightly tempered by knowing that I never really get food envy when dried fruit is concerned. 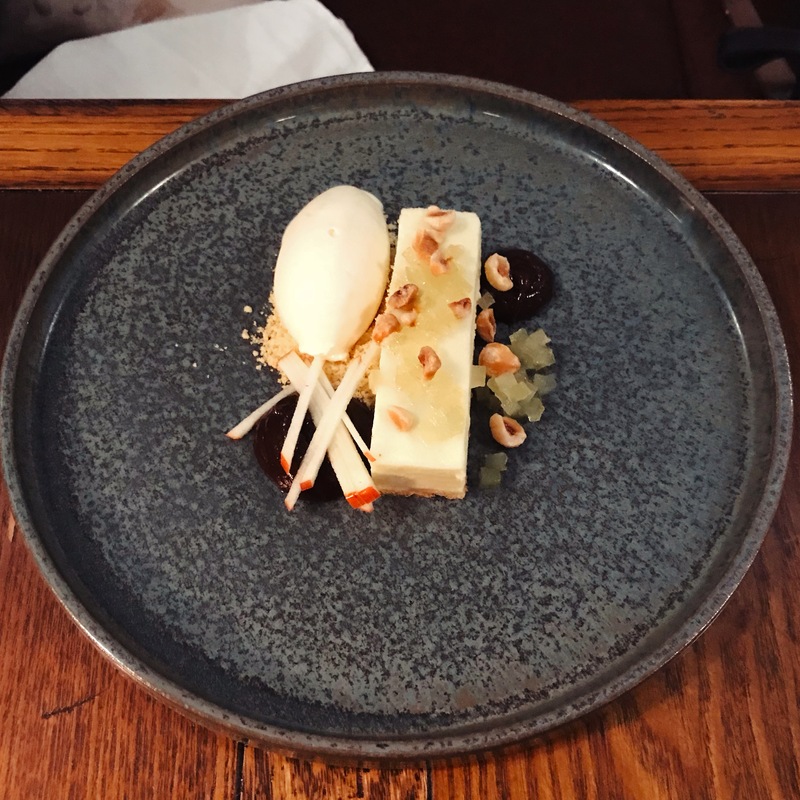 Having said that, my mother – tackling a pleasant, slightly prissy apple parfait with elderflower ice cream – might have felt differently. 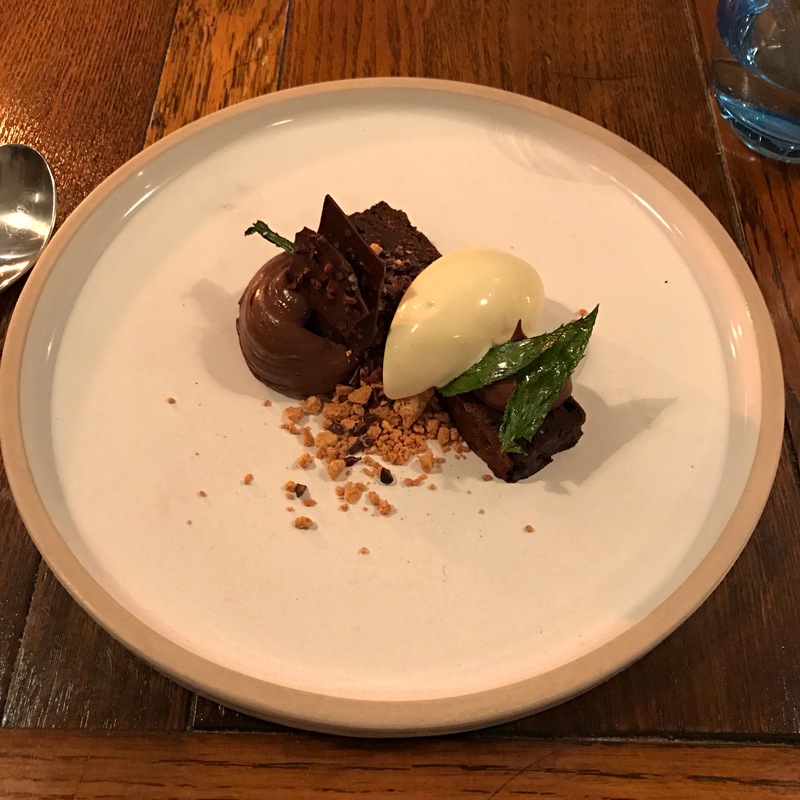 It looked pretty and clean, but when you’ve sat through two disappointing courses the last thing you want is a chaste goodbye kiss of a pudding. Even the post-dessert treats they brought over: chocolate coated honeycomb and fudge (which I suspect I enjoyed more than the other three) couldn’t undo all the damage. 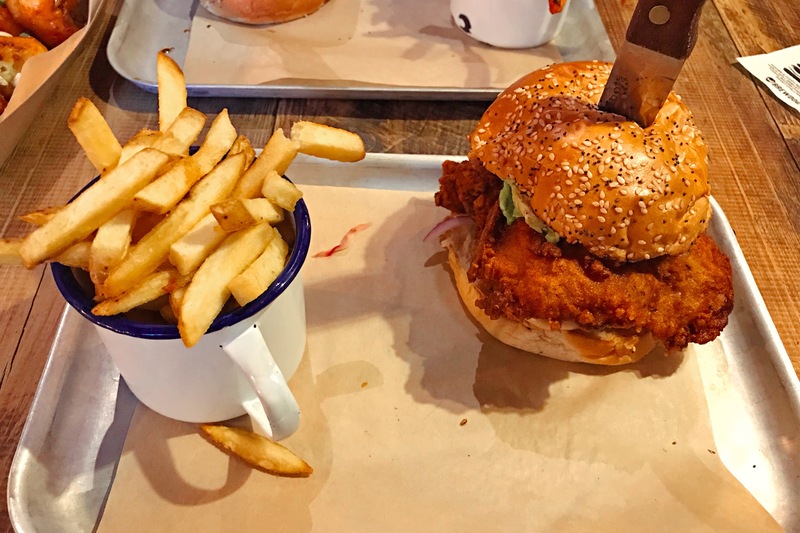 I couldn’t help feeling that it was a meal of two halves. For the first half, service was lacklustre and some of the food we wanted just wasn’t available. During the second half of the meal service became almost too solicitous, as if they knew they had some ground to make up. My suspicion was just that they were swamped for the first hour or so, and that suspicion was confirmed when we settled up: they’d had a huge number of orders for fish and chips, they said, and something about not having enough potatoes, and being short of chefs, and at that point I’m sorry to say that, nice though the waiter was, I stopped listening. Perhaps I’m being unfair – quite possibly I am – but at the level the Bottle & Glass aspires to it’s partly about expectations, and they did a decent job of limboing under mine. 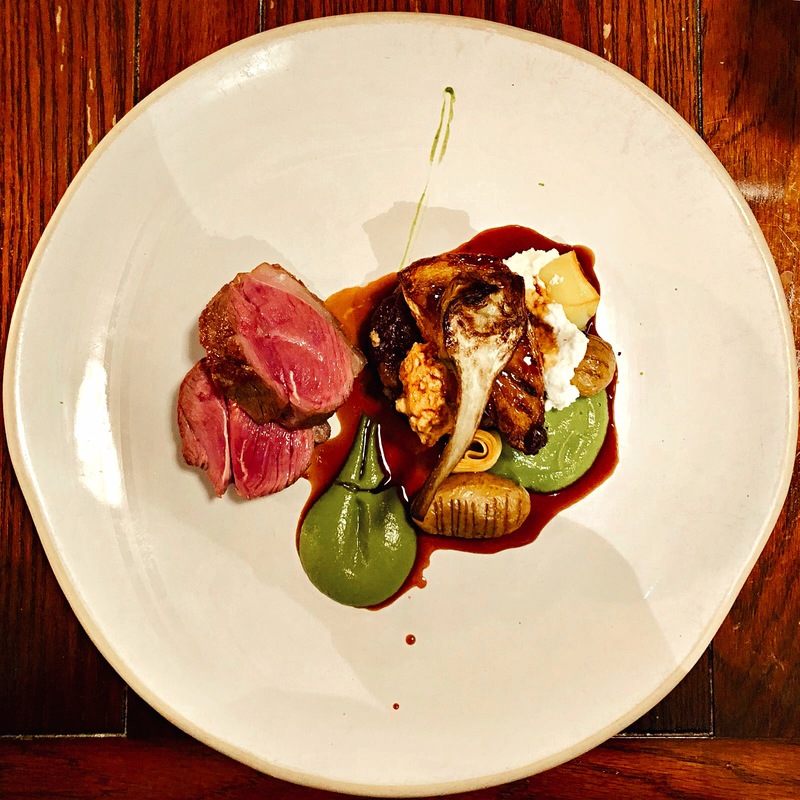 Dinner for four – three courses each, some pre-dinner snacks, a bottle and a half of red wine and three glasses of dessert wine – came to £285, including a pre-added 12.5% service charge. 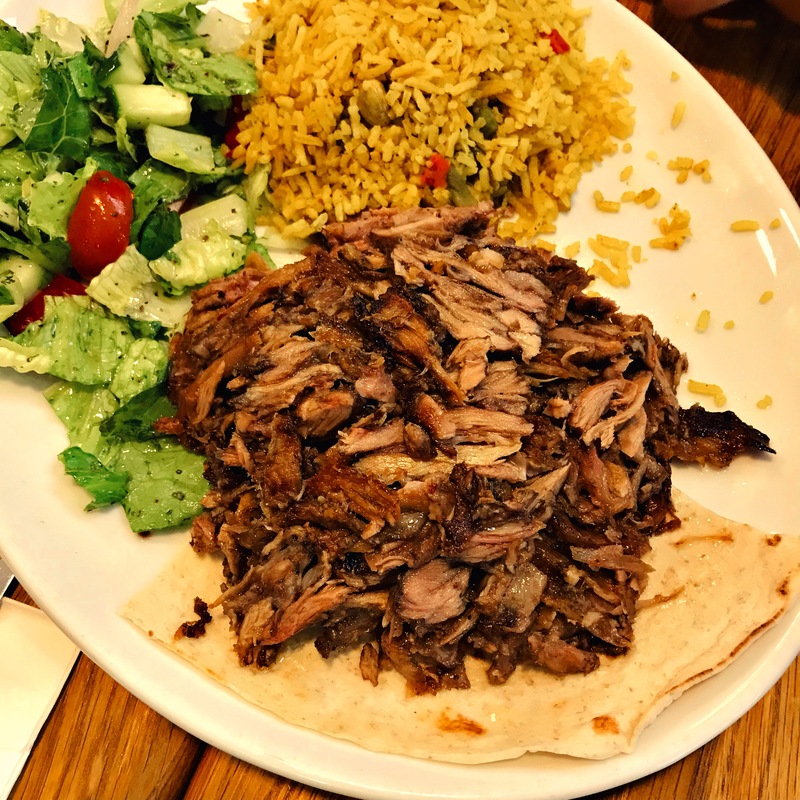 You could definitely eat for less, though, and for the quality many of the dishes felt like really good value: especially that lamb. With a meal this extensive, multi-faceted and complex I find it takes more time to digest the experience than the food. And the sheer variety of food we tried meant that we all had subtly different experiences: Zoë loved her meal, and was saying that she’d quite happily take her mother there for dinner. My own mother, on the other hand, won’t ever return: “I’d sooner go to back to the Crooked Billet” she said, as we pulled out of the car park. I can understand both points of view, and heaven knows the Crooked Billet isn’t the only competitor in these parts. 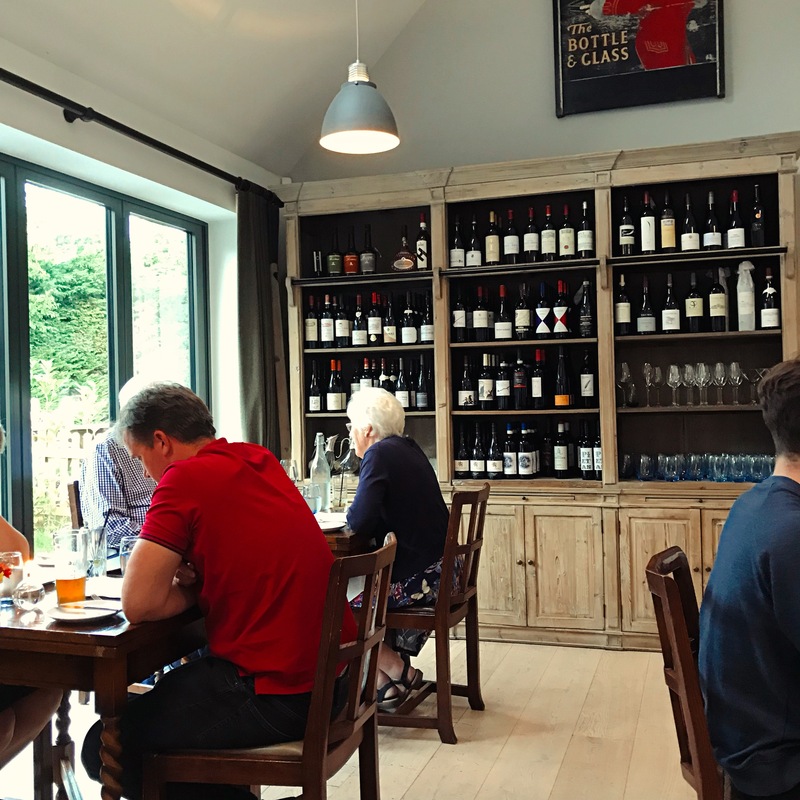 You’re also not far from the superb Bird In Hand in Sonning Common and the very serviceable Reformation at Gallowstree Common, not to mention Orwell’s in Shiplake (N.B. Since writing this I’ve been advised that the Reformation has closed). 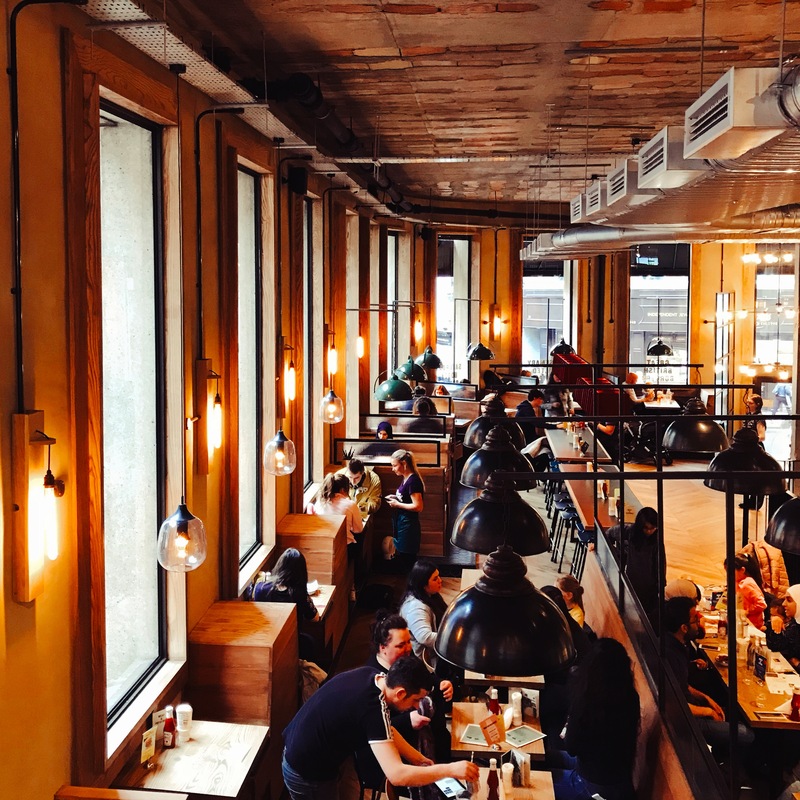 This is a well-to-do part of the country, and diners looking for good food in a pretty pub have plenty of choices. I’ve changed my mind several times about the Bottle & Glass even in the course of writing this review. I went away feeling a little underwhelmed, and then as I thought over the food I found myself revising my opinion. 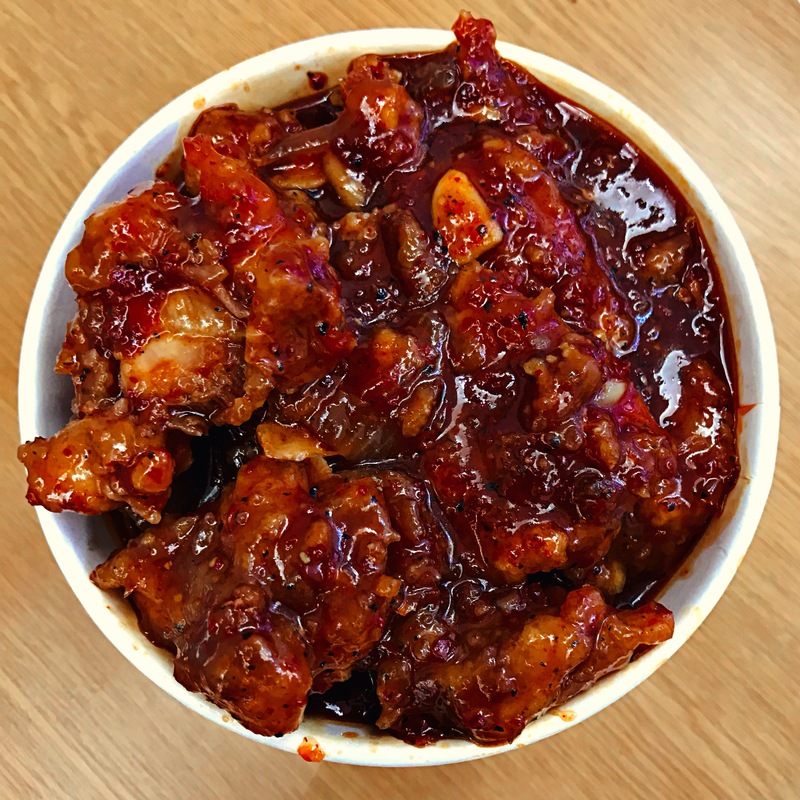 Some of it really was up there with any dishes I’ve had this year (although, in fairness, not necessarily the stuff I ordered on this visit). But then I think about the confusion of it: you serve dainty, precise food and yet you burn the toast. You proclaim how local your courgettes are at the same time as you run out of chips (can you tell I haven’t got over that?). And that, sadly, is what has stayed with me about the Bottle & Glass. So I didn’t have the perfect meal to celebrate my birthday, not by any means. But as a way of marking five years of eating, analysing and writing? Somehow it’s hard to think of a more appropriate venue.